© 2002, © 2016 by Paul Freeman. Revised 8/29/16. Howard Maish, George Leonard, Ernie Mobbs, John Martin, Harry Menephy, and Eddie Martin. 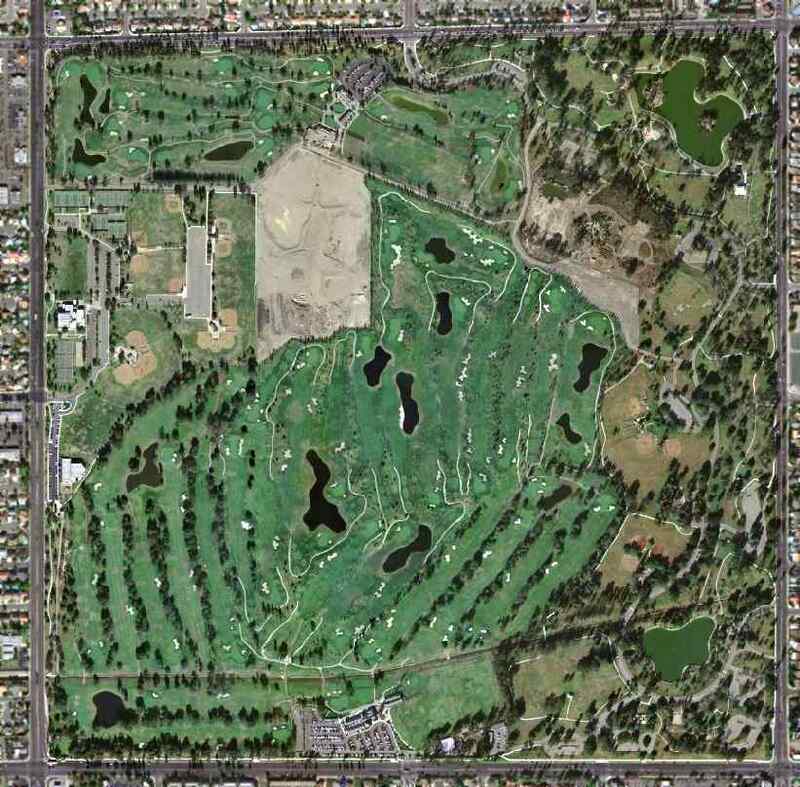 on land owned by The Irvine Company, initially without their permission. Later that same year, Eddie & James Irvine made a deal for a 5-year lease on 80 acres for $35 a month. 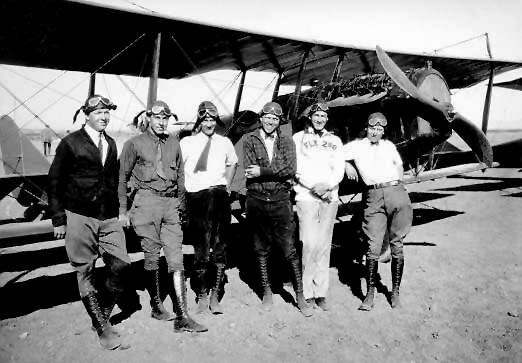 In 1924 Eddie began the Santa Ana Air Club to promote flying in Orange County. The organization was active for several years, eventually changing its name to the Eddie Martin's Pilot's Association. Eddie taught many local people to fly. became the first woman to take lessons at the airport. She developed her talents & became accomplished at acrobatics, sometimes appearing in air shows. An undated (circa 1920s) ad for Eddie Martin's Airport. It was in 1926 that Eddie was finally able to acquire a hangar for his airport. It was a portable wooden building which sold for $350. Later another portable hangar & two large permanent hangars were built. and left the running of the airport to Floyd Martin, their younger brother. which was not where John Wayne Airport sits today. His father Clearence Forsberg use to operate a store & he would sell peanuts when they had air shows there. One that he mentions is when they put a parachute on a biplane & let it settle back to the ground. was on a 1929 AAA street map (courtesy of Dan MacPherson). with 2 buildings on the north side of the field. 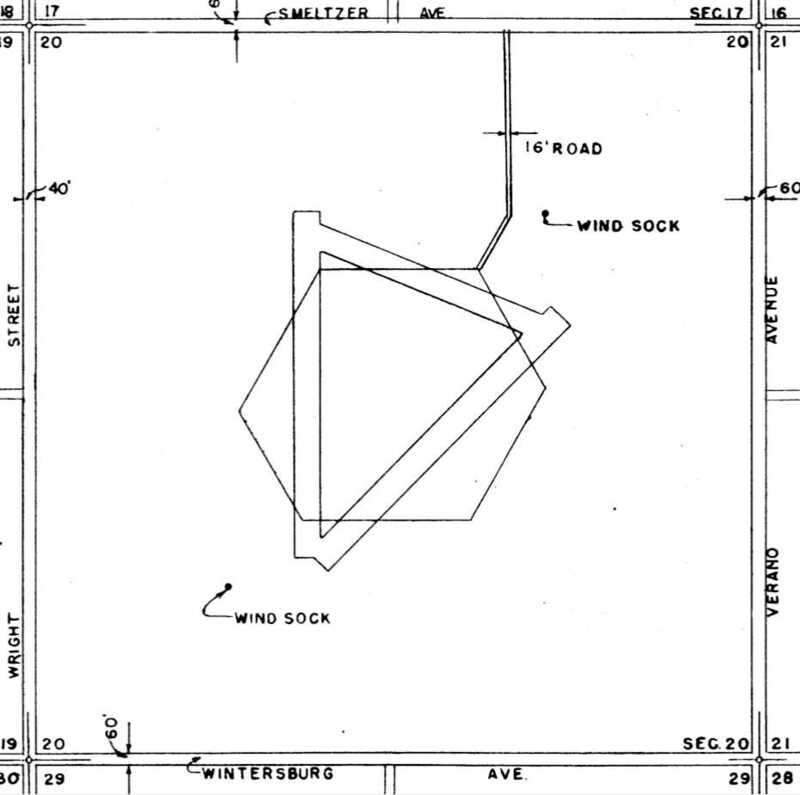 The field was depicted as a rectangular property, located south of the intersection of Newport Avenue & Main Street. Eddie Martin Field added runway lights in 1930. 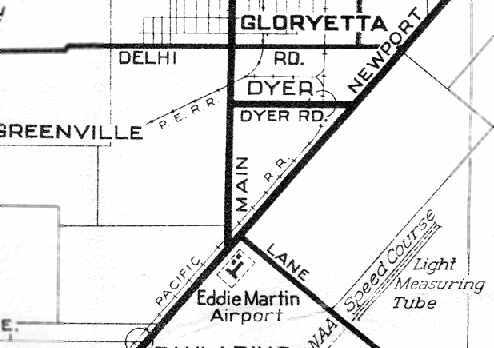 A 1930 LA County Rand McNally street map (courtesy of Kevin Walsh) depicted “Martins Airport” as a square property outline. The earliest aeronautical chart depiction of Martin Airport which has been located was on the November 1934 San Diego Airway Chart. It depicted “Eddie Martin” as a commercial field. 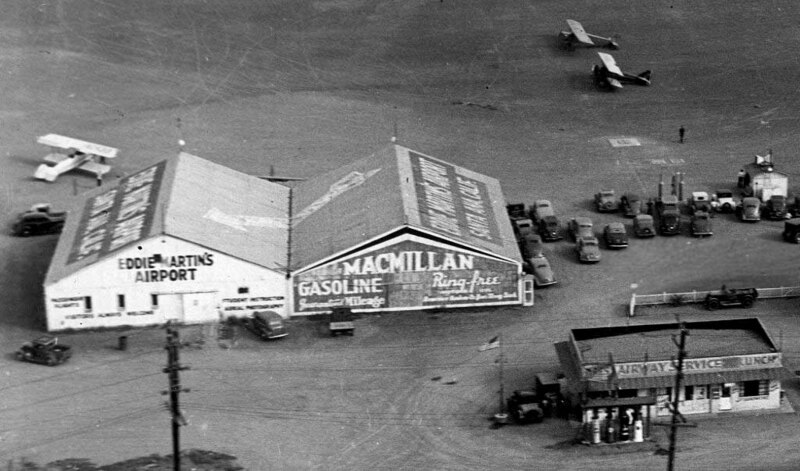 A circa 1930s aerial view of several hangars & 3 biplanes at Eddie Matin's Airport. 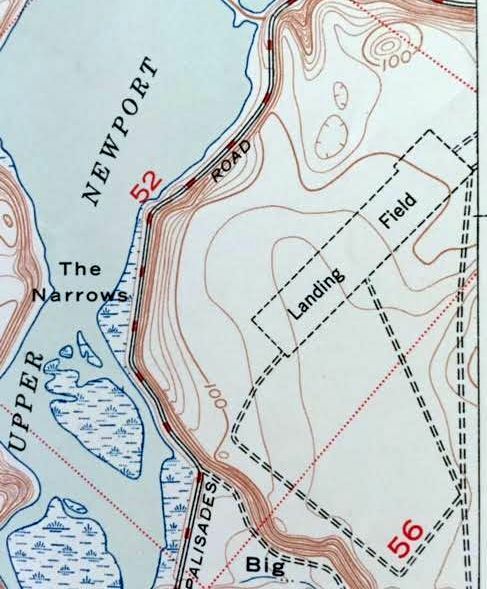 The earliest topo map depiction of Martin Airport which has been located was on the 1935 USGS topo map. It depicted “Martin's Landing Field” as a rectangular property with several buildings & an airway beacon at the north end. measuring 2,040' x 1,320', with the entire field available for flight operations. A hangar was said to have “Eddie Martin's Airport” marked on its roof. The field was illuminated, and was said to offer service, day & night. depicted it as a rectangular grass field. was on a 1940 Shell street map (courtesy of Gary Alexander). 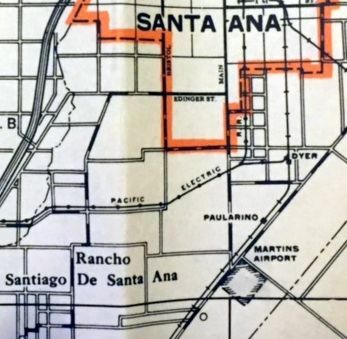 At some point between 1940-45, the Santa Ana Army Airfield was established on land adjacent to Martin Field, to the south. The two fields were not located on the same property, as has been repeated elsewhere. But flight operations at Santa Ana AAF probably resulted in the closure of Martin Field at this point. only Santa Ana AAF was depicted, and Martin Field was no longer depicted. and its buildings had been removed. 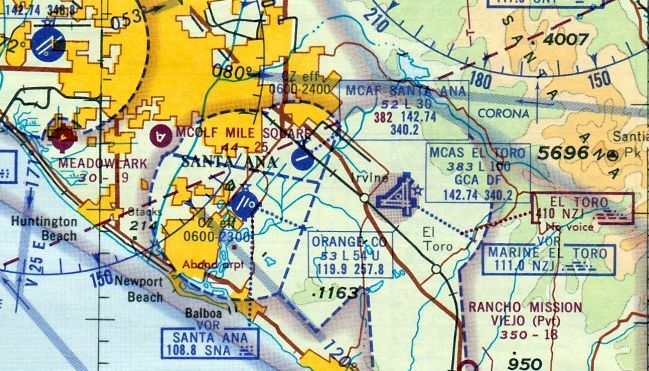 The Santa Ana AAF located to the south eventually became today's John Wayne Orange County Airport. 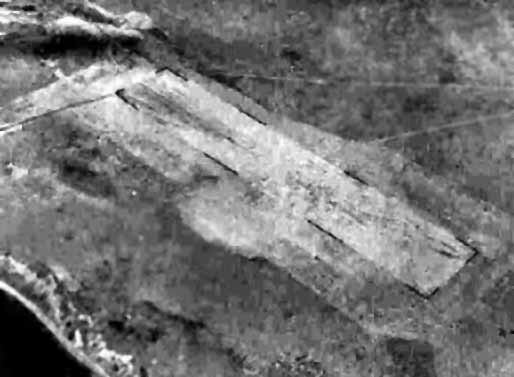 As can be seen in a 2004 USGS aerial photo, not a trace remains of Eddie Martin Airport. just north of John Wayne Airport. but curiously omitted the actual airfield circle symbol. in the immediate aftermath of the Second World War. to continue to be used as a general aviation airport. announced their intention of establishing an airport in Costa Mesa in February 1946. They planned to establish a 214-acre airport on land leased from George Capron. but differences were eventually resolved. using a Ryan PT-22, Fairchild PT-19, Vultee BT-13A, Taylorcraft, Globe Swift, Aeronca, Piper Cub, and Stinson L-5. Gilmer Murphy, one of the 3 founders of the airport, was President of Pacific Coast Airways. The first runway was described as running east/west, paralleling 19th Street. A small 2-story building about halfway down the runway served as the administration building. The 2nd floor had glass on 3 sides, and served as a control tower. The airport was reported to be completing its north/south runway & its hangar within 10 days. described "Sky Harbor" as "a busy place". and was described as having a 2,600' unpaved runway. and described as having a 2,700' hard-surface runway. a 2,800' north/south runway & a slightly shorter east/west runway. 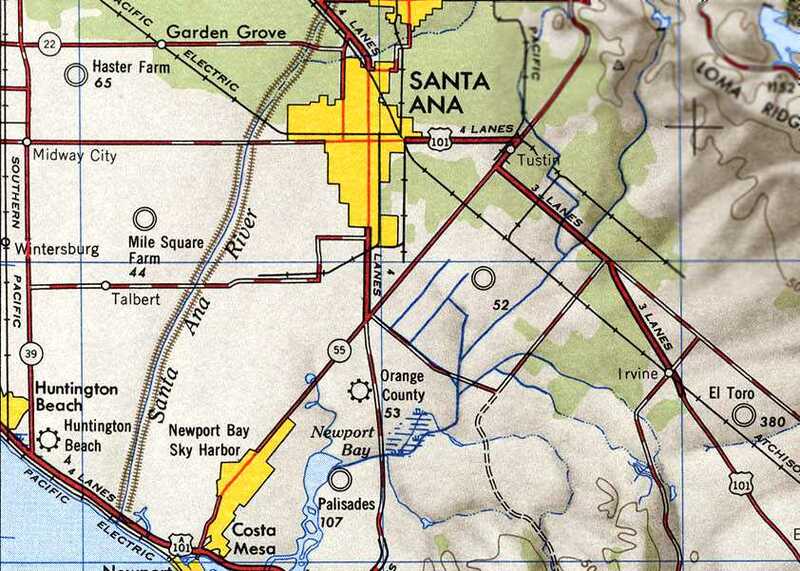 Balboa Airport was depicted similarly on the 1950 USGS topo map (courtesy of Scott O'Donnell). A photo from the 5/13/49 issue of the Costa Mesa Globe Herald (from the Costa Mesa Historical Society, courtesy of Jerome Vandewalle). taking possession of its third plane (type undetermined) at the "Costa Mesa Airport". 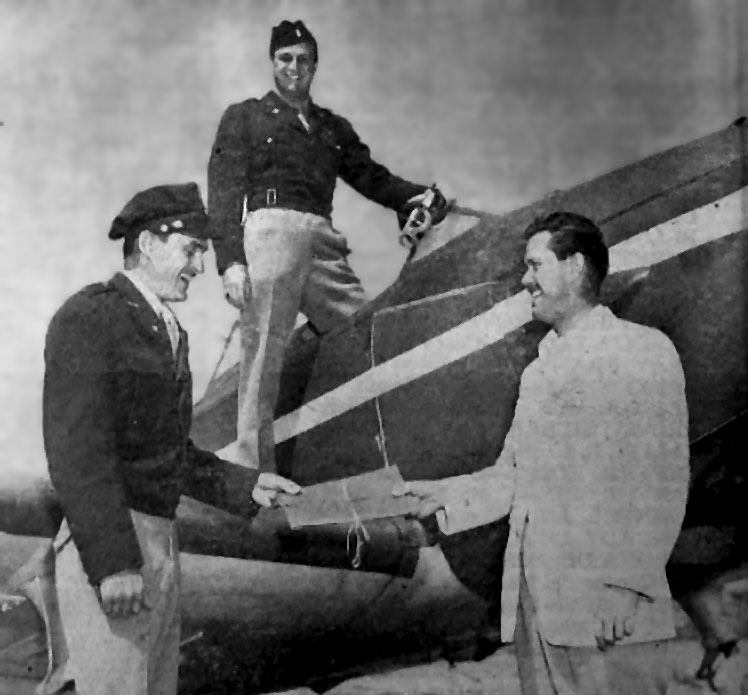 receiving the papers from the aircraft from seller Tom Harris (who was also the executive officer of the squadron). 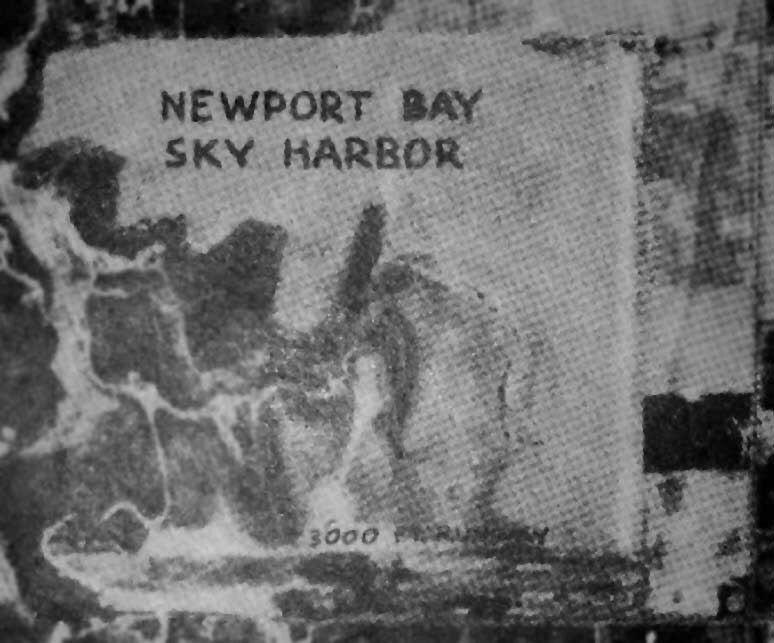 An undated photo (from the Costa Mesa Historical Society, courtesy of Jerome Vandewalle) of the "Newport Bay Sky Harbor" Airport. A 3,000' runway is depicted along the southern edge of the property. which otherwise appeared vacant, soon to be redeveloped. 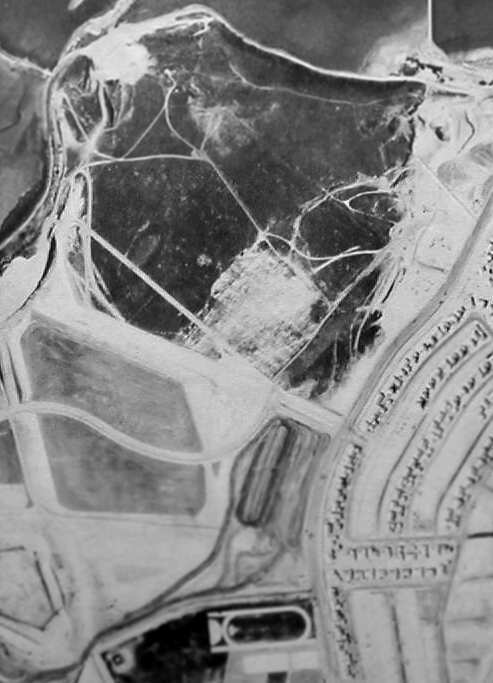 the airport "was torn up in early 1953 to make way for the huge Newport Vista housing tract. and not a trace of the former airport appeared to remain. The site of Balboa Airport is located southwest of the intersection of Victoria Street & Placienta Avenue. with what appears to be an adjacent slightly larger hangar under construction. Anton Luebkeman & his wife came to California to Germany in 1904 & bought 104 acres of land in Buena Park in 1910. In 1935 the Luebkeman family bought another 100 acres, on which they built an airfield in 1938. They rented hangar space to area flyers, including eventual billionaire Howard Hughes. 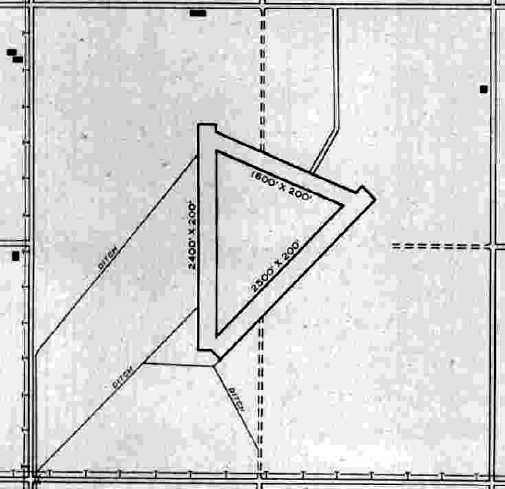 According to the Army Corps of Engineers, the Luebkeman Airport initially had a grass 2,200' east/west runway. 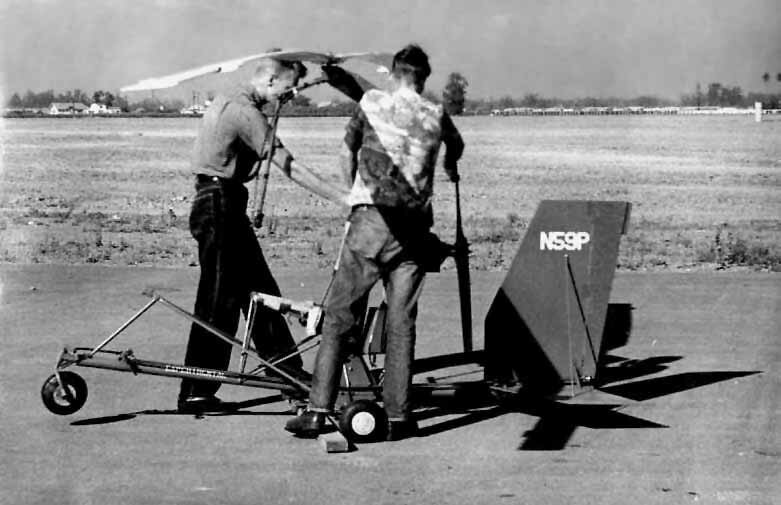 Luebkeman Airport provided basic flight training under the Civilian Pilot Training Program beginning in 1939.
along with several single-engine taildraggers. was on the August 1940 San Diego Sectional Chart (courtesy of Chris Kennedy). It depicted Luebkeman as a commercial/municipal airport. A 1940 photo showing the filming of the movie The Great American Broadcast at Luebkeman Airport, with a hangar in the background. The airport was rented by 20th Century Fox Studios for 5 days for filming. continued to depict Luebkeman as a commercial/municipal airport. (which seems excessive – this may actually have been referring to 3 runways). which was investigating the business potential of the site. The airport was not listed in airport directories of the time. 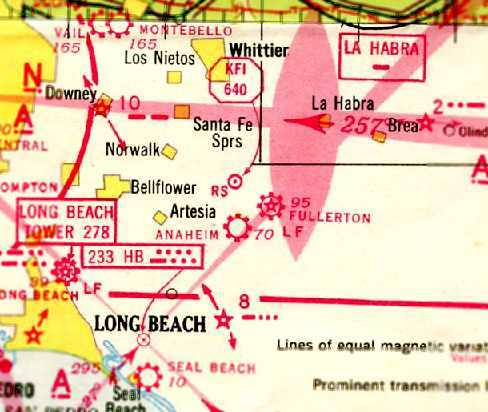 was on the October 1941 LA Sectional Chart (courtesy of Chris Kennedy). It depicted Anaheim as a commercial/municipal airport. 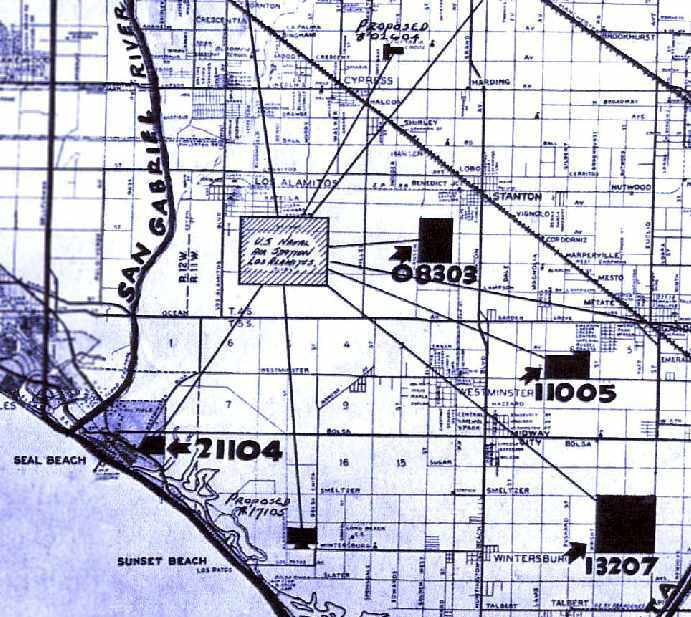 Civilian use of Anaheim Airport evidently ended upon the declaration of War in December 1941.
five miles southwest of the site. depicted the Anaheim Airport as “Proposed 02604” at the top. No information has been found confirm actual Navy use of the property during the war. but curiously it was unlabeled. 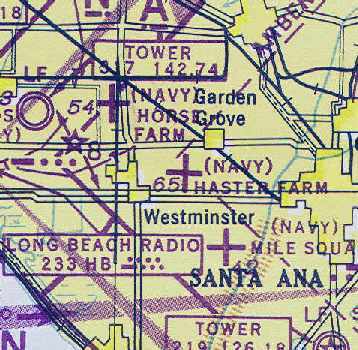 According to the Army Corps of Engineers, the Navy terminated their lease of Anaheim Airport prior or during 1945. No material was found to determine whether the Navy made any improvements to the site. 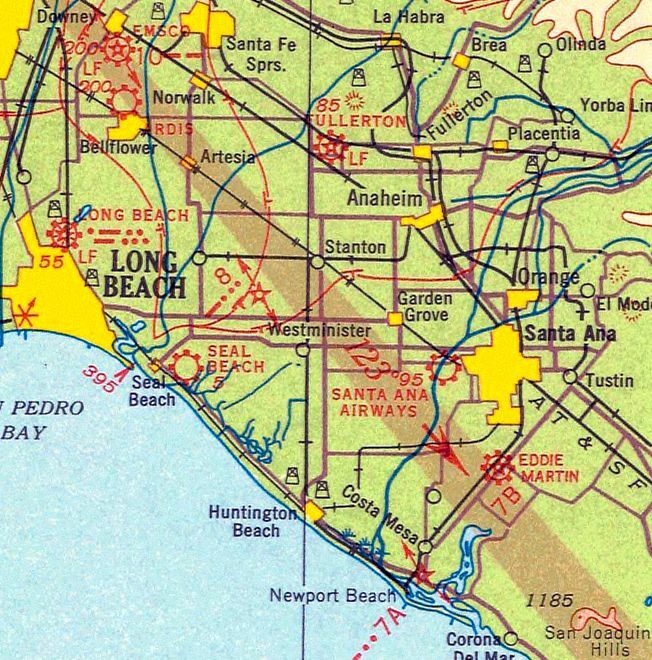 Anaheim Airport was not listed among active airfields in the 1945 AAF Airfield Directory (courtesy of Scott Murdock). After WWII, the Luebkeman family did not reopen the airport. The metal hangars were used for storage of farm equipment & cars. but there was no other recognizable sign of an airport. but residential streets had been laid out in the surrounding fields. in a subdivision bounded by Knott Avenue, La Palma Avenue, Crescent Avenue and Valley View Street. Up until the mid-1970s, a portion of that area was a large field that had an old house on it. In addition to the house, the property had a very large old metal building that had 'Anaheim Airport' painted on the roof in large faded lettering. The building had very large doors as well. The field was overgrown & strewn with various things (pieces of machinery, an old travel trailer, etc.). In the mid-1970s, the field was developed with single-family homes. and was occupied by what we believed to be the owners of the property who sold the land to developers. (although there was a church which is still there located in the southeast corner of the property on Crescent Avenue). The old house was (and I believe still is) located just north of the church (on [an aerial] view it looks like a white 'L'). According to the Army Corps of Engineers, as of 1999 the site was a residential area of single-family homes. but the original house appears to remain just north of the church at the bottom-left. Thanks to Shawn McBurney for pointing out this airfield. including NOLF 13207 (Mile Square). which used as an auxiliary for Naval Air Station, Los Alamitos. It was used for carrier deck qualification practice by Navy aircraft. the others were Horse Farm NOLF, Haster Farm NOLF, Seal Beach NOLF, and Palisades NOLF. was a circa 1943 chart of NAS Los Alamitos & several of its outlying fields (courtesy of John Voss). 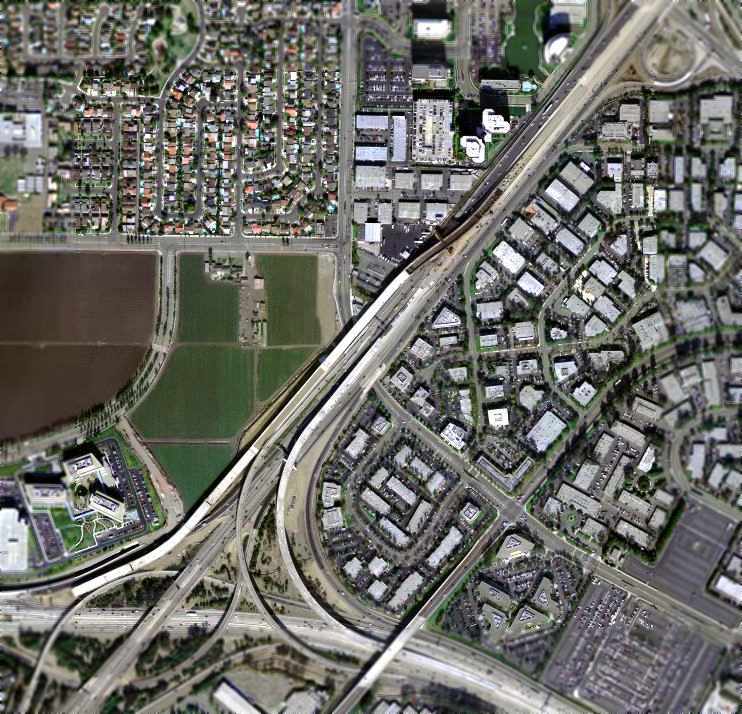 NOLF Seal Beach (21104), and 2 “proposed” fields which were never built. the mission of NAS Los Alamitos was primary training. The original field was a asphalt-type [hexagonal] mat (very similar to the landing mats at OLF Haster Farm & OLF Horse Farm). as well as the eventual 3-runway layout. 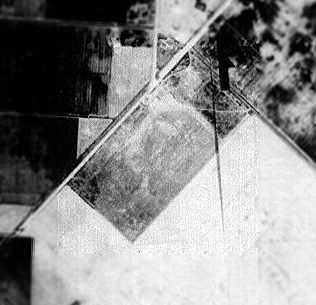 The earliest photo which has been located of Mile Square NOLF was a 9/21/43 aerial view (courtesy of Brian Rehwinkel). of the original hexagonal landing mat. a geographical reference (as in Palisades), or a numerical designation (as in many of the fields in Corpus Christi). Of course, Mile Square was named because it was nearly a full land section/1 square mile (I believe it was actually just over 631 acres). as a 640 acre square property within which were 3 bituminous runways, the longest being the 2,500' northeast/southwest strip. 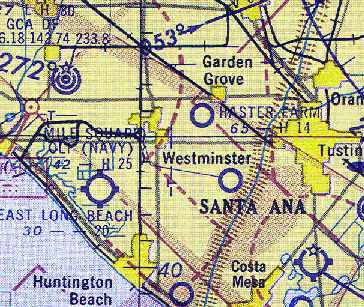 "(Navy) Mile Square", as depicted on the August 1945 San Diego Sectional Aeronautical Chart (courtesy of Chris Kennedy). 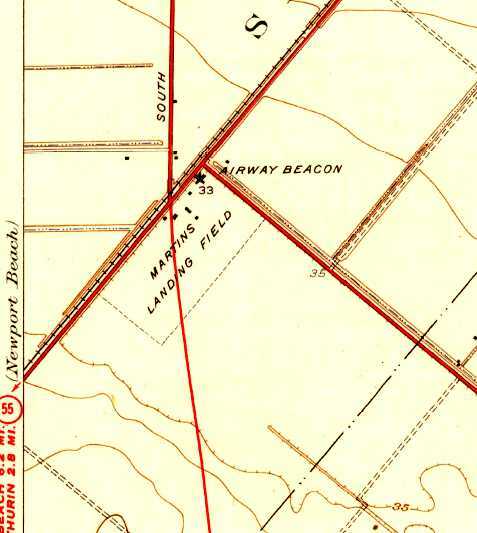 The 1947 USGS topo map labeled the field as “Mile Square Farm”. the property was labeled merely "Naval Reservation". or simply omitted from the map. with an aircraft carrier landing area outline painted on each runway end. The field was surrounded by empty farmland. 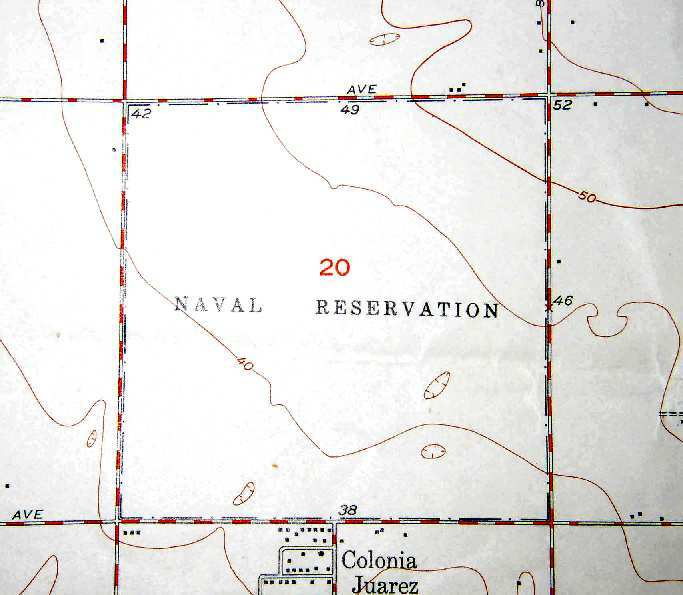 "Mile Square OLF (Navy)", as depicted on the September 1955 San Diego Sectional Chart (courtesy of Chris Kennedy). by helicopters based at nearby MCAF Santa Anna (later renamed MCAS Tustin). Bob Cannon in front of his Luscombe after landing at Mile Square in 1956.
as he landed his Luscombe "in June 1956 at the then open & unused Mile Square airport. Note the lack of houses in the background." "I went to land there one day & the Marines had a jeep cruising around it. I made several low passes strafing the jeep; I mean ground level runs. I have no idea at this time what ever possessed me to think that I could get away with it. Maybe one pass & then scram, but no, I made several passes. That night I got a call from some Lieutenant in the Navy or whatever asking me what was up. I told him I guess I was just a frustrated fighter pilot wannabe. He suggested that I come down & sign up. I told him that I wasn't that frustrated. I got off with just a warning miraculously." A circa-1950s photo by Bob Cannon of an autogiro being tested at Mile Square. In 1959, the Navy leased approximately 500 acres to the Heil Ranch Partnership for agricultural purposes. on the September 1959 San Diego Sectional Aeronautical Chart (courtesy of Chris Kennedy). A 1964 aerial view of Mile Square, from the Anaheim Library (courtesy of Scott O'Donnell). 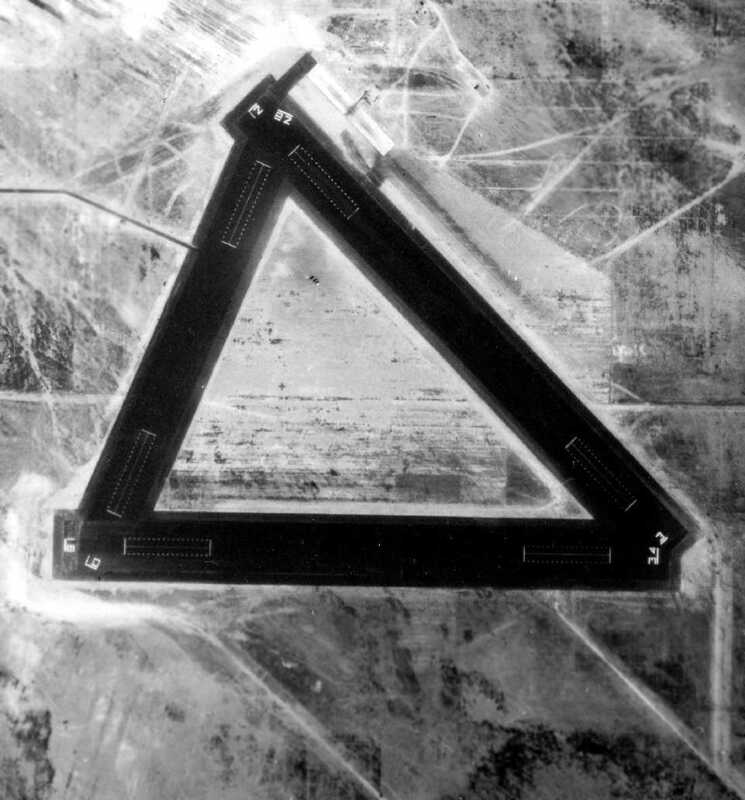 two 2,500' runways connected by a 2,000' strip, forming a triangle. Note the complete lack of development around the airfield - it is surrounded by nothing but farmland! as having 3 paved runways, with the longest being 2,500'. on the 1966 San Diego Sectional Chart (courtesy of Chris Kennedy). A 1967 Orange County Road Department Survey Map of the runways at Mile Square (courtesy of Scott O'Donnell). 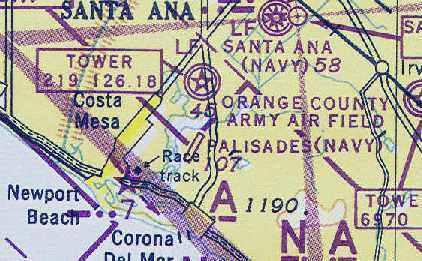 In March of 1967, Orange County entered into a long term lease with the Navy Department for the perimeter acreage of the site. the county was permitted to continue the agricultural lease. In 1970, the first 85 acre phase of Mile Square Regional Park was opened. Phase II which added ball diamonds & a children's play area was constructed & opened in 1973. The Phase III development, extending the park northward to Edinger Avenue was constructed & opened at the end of 1976. 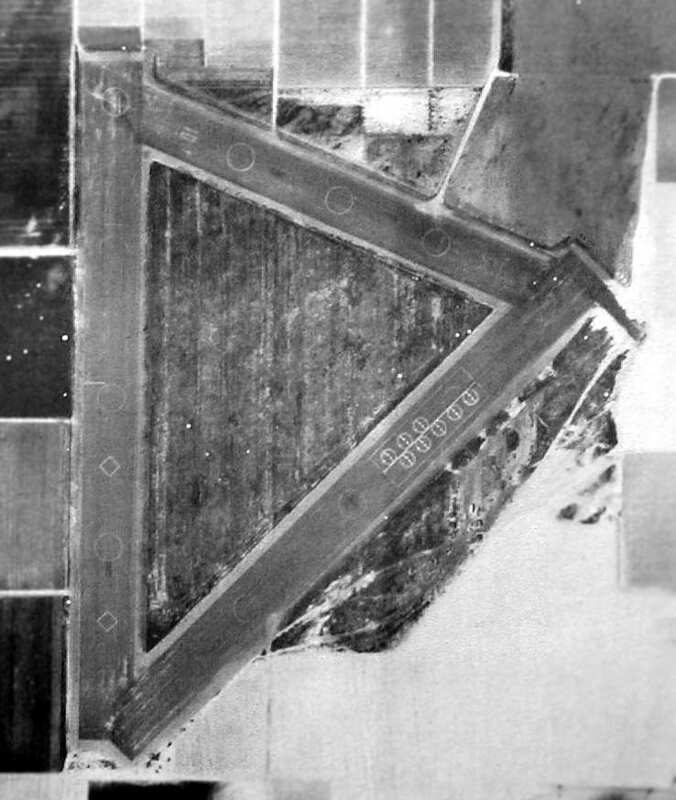 A 1972 aerial view showed the 3 asphalt runways were each marked with a closed “X” symbol. the County of Orange received title to the perimeter acreage at no cost under the Federal Legacy Parks Program. Military operations in the center airfield ceased in 1974. 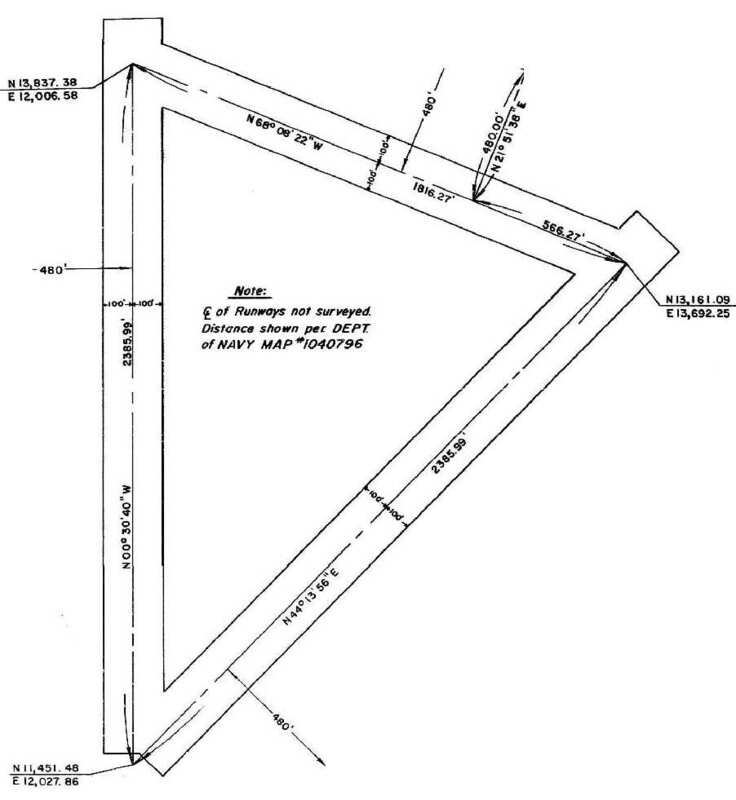 In 1975 the county received an annual permit to operate the center triangle area for public recreation. 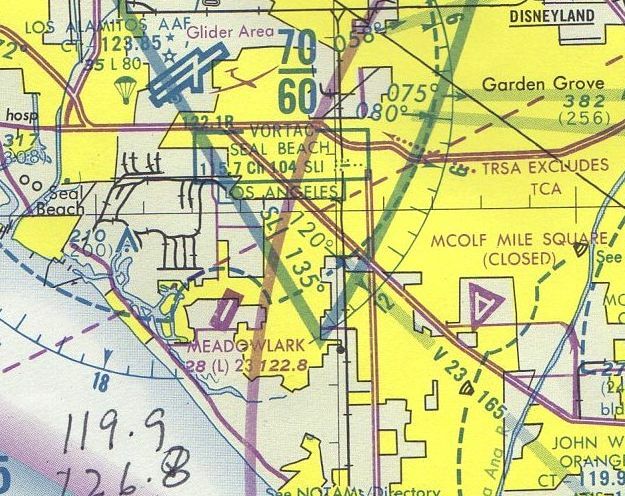 The July 1980 LA Terminal Chart (courtesy of Jim Hackman) depicted “MCOLF Mile Square” as a closed field having 3 paved runways. The park's Phase IV development commenced in the spring of 1987. Found within this final phase is a 18-hole executive golf course, complete with club house, driving range & banquet facility. Additional acres of park land include picnic facilities, bicycle trails, landscaping and a second park entrance. 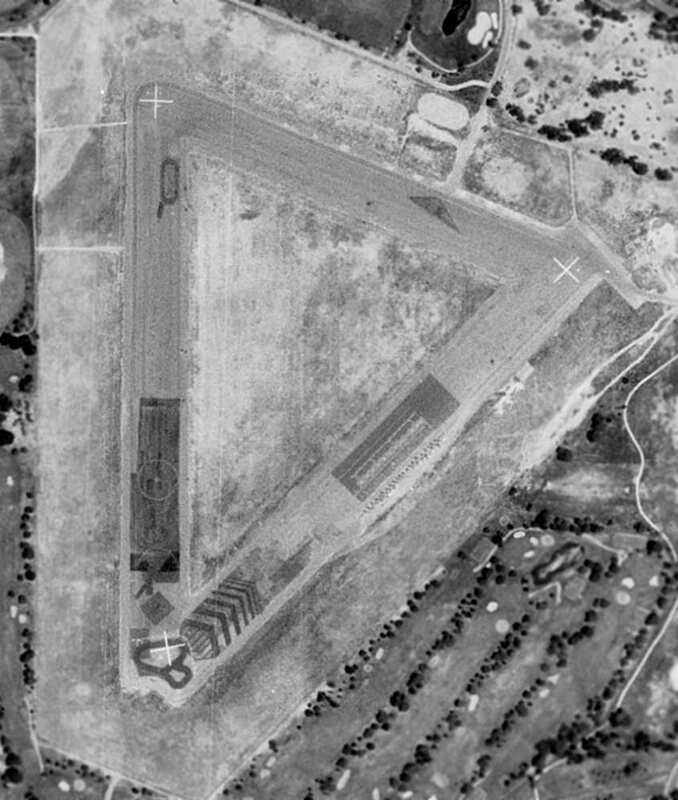 The 3 paved runways still existed when the above 1994 USGS aerial photo was taken. 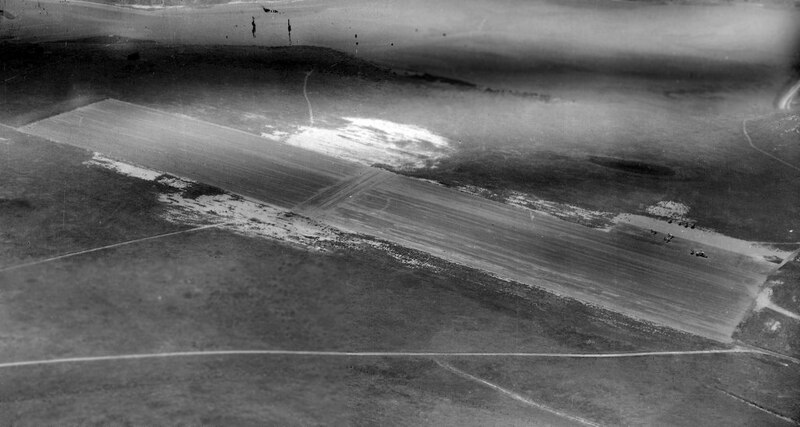 The north runway, as it was used for landsailing, before being destroyed for golf course expansion. At one point a local organization called Save Mile Square was trying to save the park from the greed of local developers & politicians. (because we certainly don't have enough golf courses!). 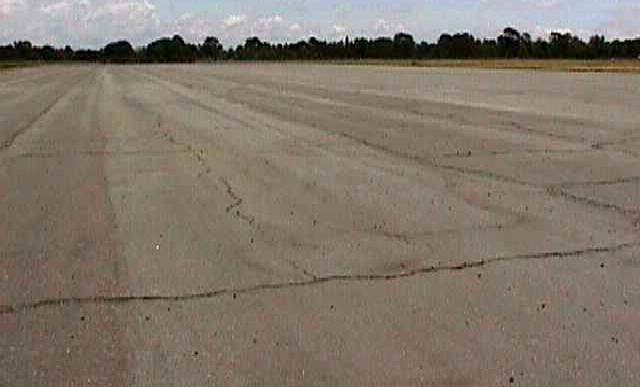 John Smith reported in 2004 that "all remnants of the airfield are completely gone." with only the northern edge of the east/west runway still hinting at the layout of the former airfield. Thanks to Robin Dee for information about Mile Square. See also: A 1994 Army Corps of Engineers report. from the ”The 1945 AAF Airfield Directory (courtesy of Scott Murdock). The date of construction of this WW2-era Navy satellite airfield has not been determined. the others were Horse Farm NOLF, Haster Farm NOLF, and Mile Square NOLF. Mile Square was built in 1942, so Palisades was probably built around the same time. It depicted the field as a single northeast/southwest runway. as having a single 2,500' seal-coated east/west runway. "Palisades (Navy)", as depicted on the August 1945 San Diego Sectional Chart (courtesy of Chris Kennedy). "was a standard 2,500' long & quite wide... maybe a hundred yards or more. 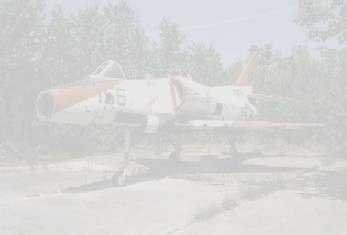 where they used it for remote control aircraft (Curtiss SO3C Seagull)." The 1947 USGS topo map labeled the field simply as “Palisades”. Palisades apparently saw some reuse by the Navy starting in 1947. John Voss reported, “Victor Smith was assigned to the base [NAS Santa Ana] in 1947. He commented that VU-7(a) was based at NAS Santa Ana for the continuation of pilotless aircraft evaluation. with Beech SNB Expeditors as the drone controllers. and that the small quonset building was the 'mess area' when they were doing field operations there. The operations at Palisades were Target Drone Operations. The unmanned drones were launched & flown out to a target area for ship-to-air target practice. If they survived they were brought back to Palisades; from there, back to home base. A May 1948 U.S Navy aerial view looking west at Palisades OLF (courtesy of Brian Rehwinkel). Brian observed, “You can see the lines of cliffs (palisades) that gave the field its name. showing 3 unidentified aircraft on the ramp. 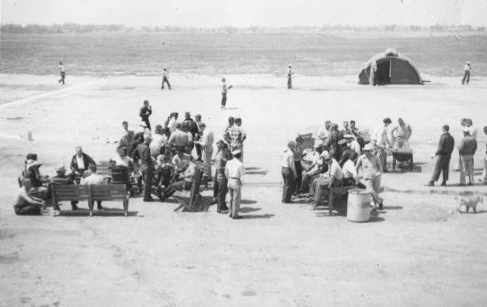 A 1949 photo of VU-3 squadron members at their annual Beer & Bar-B-Que Party at Palisades NOLF (courtesy of Victor Smith, via John Voss). but it was labeled merely "Landing Field". 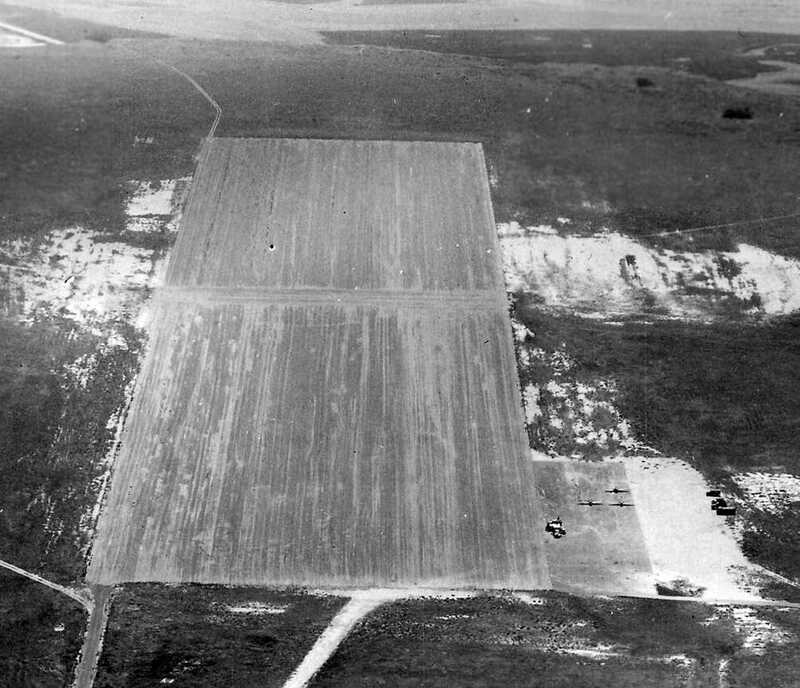 A 1952 aerial view depicted the Palisades field as having a single paved northeast/southwest runway. 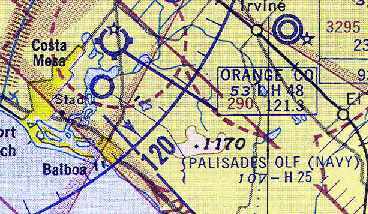 "Palisades OLF" was still depicted on the September 1955 San Diego Sectional Aeronautical Chart (courtesy of Chris Kennedy). The Aerodromes table described Palisades as having a single 2,500' bituminous runway. as it was no longer depicted at all on the September 1959 San Diego Sectional Chart (courtesy of Chris Kennedy). would take our cars to OLF Palisades & do a bit of drag racing there. It was totally abandoned & a nice road led right to the end of the strip. There was a small Quonset hut remaining & a wind direction vane (still working & creaking it the wind). 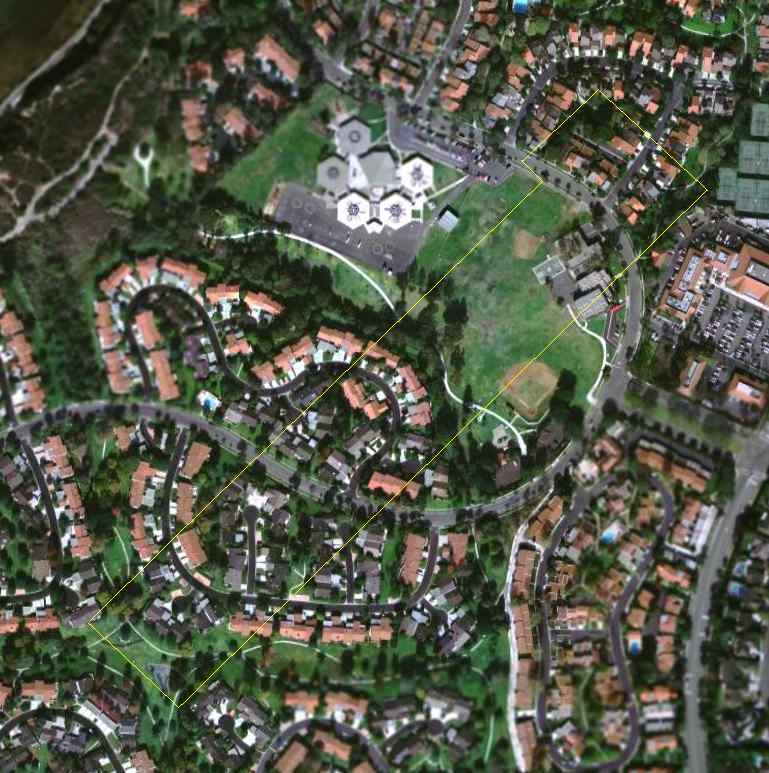 OLF Palisades was [eventually] converted into housing (and nice ones at that)." 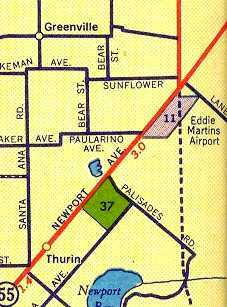 Palisades was definitely closed by 1960, as it was labeled "Aband arpt"
on the 1960 LA Local Aeronautical Chart. 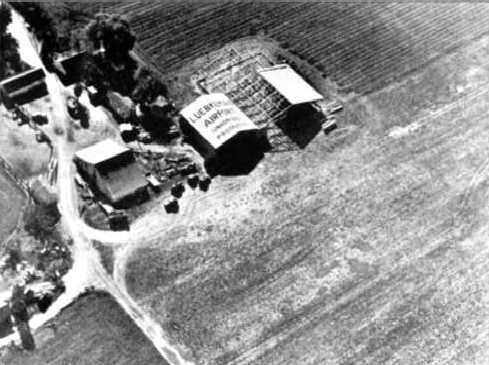 A 1964 aerial view of the site of the Palisades airfield, from the Anaheim Library (courtesy of Scott O'Donnell). and a high school track has already been constructed at the south end. 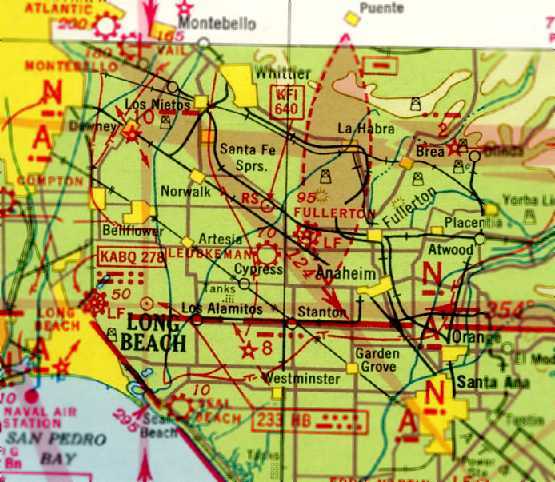 The Palisades airfield was not depicted at all on the 1965 LA Local Area aeronautical chart (courtesy of John Voss). with the surrounding area all having been filled in with dense housing. A 2006 aerial photo, annotated by Chris Kennedy to show the location of the former runway of the Palisades airfield. 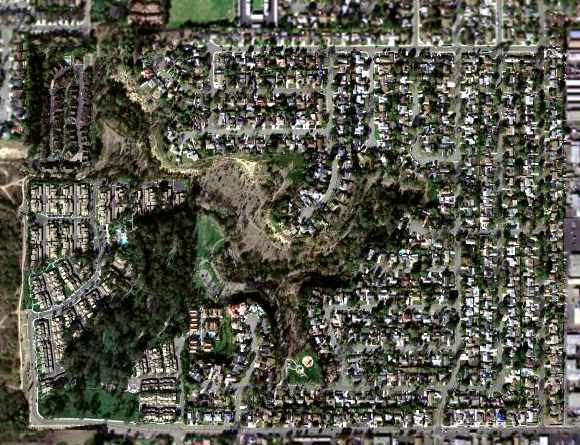 The site of Palisades NOLF is located just west of the intersection of Eastbluff Drive & Vista Del Oro.